Downers Grove S Mustang Preview: Leaderboards Are On Alert! It is expected to be a glamorous evening on the track in the way of relays. No individual will have an opportunity to stand alone and shine. He or she must do it completely with three other teammates Monday evening with a baton. Relays meets are fun but the real intent is to go fast. This is that evening! 4x800 (9:22.68/Schaumburg 2011): The 9:30.90 time that Glenbard West put up over the weekend is a good mark which a handful of teams have an opportunity to achieve. One such team that if they load up will not only surpass the Hilltoppers state best, the Downers Grove South quartet will be afforded an opportunity to break the meet record. The Mustangs all of sudden now have a national elite card in their deck by the name of Erin Reidy. The junior recently ran a smoking IL#1 2:11.47 for 800m on this very same track. DGS has two other girls at 2:21 or better in Olivia Duax and Becky Versaskas. The fourth leg very well could be distance ace Brenna Cohoon whose open best is 2:25 from freshman year. Cohoon does not run half-miles very much, but it is certain that she will be able to hold her own. Defending state champion Hinsdale Central has to be considered a wild card here. They have several members back from that team, but no one knows for certain who is going to compete. The Devilettes took second to the host last year. The always dangerous crew from Yorkville is in the field. The Lady Foxes are very strong as a distance unit but do they have the legs to turn it on with the element of speed? They and Batavia come in with a strong case to overthrow the regime. The Bulldogs will see freshman sensation Katrina Schlenker in the mix. Schlenker has clocked 2:17 and 4:55 individually. Hoffman Estates, Lyons Twp, Minooka, and Prospect will try and overcrowd the field with fast efforts of their own this evening. 4x200 (1:41.03/Lincoln-Way East 2016): There are six sections of racing here. Things begin to get serious around the fifth one. It's where we should see our first sub 1:48 offering. That's a teaser though. The state best is 1:44.57 by Homewood-Flossmoor. Could that get challenged by Whitney Young, Bolingbrook, Lincoln-Way East, or West Aurora? If they can get the stick around the track clean and with good execution yes. If you are a betting person put money on Bolingbrook with the K's. That's in Kayla Walters and Katelyn Johnson. Both are speedy hurdlers who can run fast on relays. 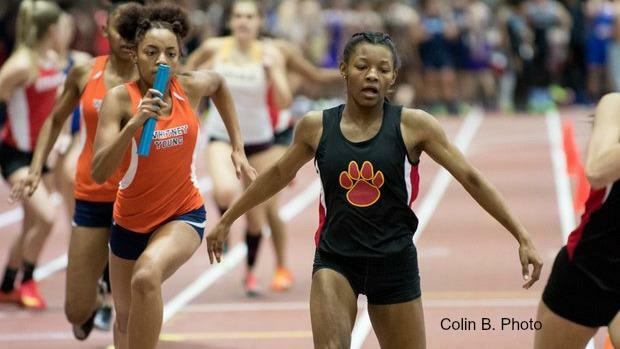 West Aurora has Cinnamon aka Dajour Miles if she chooses to compete with the New Balance Nationals looming later this week. Ahh, we almost forgot Whitney Young. The Dolphins are fast once again despite the graduation of star Amira Young. They have the fastest time of anyone in the field this season at IL #4 1:46.93. Don't overlook them! 4x400 (3:54.77/Lincoln-Way East 2016): Be sure to stay for the final section #6 where it could be a pick 'em. Lincoln-Way East will attempt to win another title on the strength of their hot hand senior Taylor Wright. Wright is one of the state's top 400 runners. She could muscle her team near the state best 4:00.86. West Aurora could challenge if they stack as well as Hoffman Estates. 4x800 (7:45.80/Sandburg 2016): Everyone knows this is Illinois' coming out party. This is where we dot the national leaderboards with our presence. So far it's been a stalemate in terms of fast times with only York running under 8:20. The Dukes 8:08.13 is solid but it will be compromised by more than a dozen teams. One such team is defending state champion Sandburg. The Eagles are known to run their best here as they hold the top two all-time marks. They return three of four runners from last May and will lead the way. Naperville Central will have an opportunity to prove how good they are with a potentially super team with big dog Thomas Shilgalis on it. The Redhawks have a seed time of 7:55 and rightfully so when Shilgalis can run under 1:55 with ease. They were all-state performers last year without their main man. All four guys are back. Downers Grove North and cross-town rival South will fight to stay in the mix. The always tough Minooka squad cannot be overlooked. 4x200 (1:30.50/Plainfield South 2011): This event has been more of follies than producing state-leading marks. The fans will get a kick out of road raged teenagers with batons. But seriously Lockport is the only team in the field ranked in the top 10. Batavia, Neuqua Valley, and Proviso East will look to join the flock. 4x400 (3:22.63/Plainfield South 2011): The showstopper usually sends those who remain home with a smile. Batavia, Minooka, and Lockport all come in with times ranked within the top 10 of the state. One of them could go home with a sub 3:30 clocking.